Total Gym is a San Diego-based company that manufactures innovative fitness equipment used in various settings, including physical therapy clinics, gyms, homes, hospitals and universities. The company's goal is to create equipment that enhances body-weight exercises and provides a more effective workout. The Pilates Reformer is a machine designed by Joseph Pilates and is also used in many of the same settings as Total Gym, such as physical therapy clinics, gyms and homes. The reformer is designed to facilitate body-weight exercises through a suspension-based design in order to provide a more effective workout. Both machines have their own exercises designed specifically for them. When comparing these two pieces of equipment, start by looking at pricing. The Total Gym runs anywhere from $1,300 to $4,900 at the time of publication. A Pilates reformer can be anywhere from $400 to $6,000 at the time of publication. You can get Pilates reformers from retailers such as Peak Pilates, AeroPilates and Balanced Body. Another consideration is the size of the machine. As this investment will take up space in your home, it is good to look at how much space you are willing to sacrifice for the equipment. The Total Gym takes up anywhere from 12 to 28 square feet,] and weighs from 80 to 218 pounds. The larger Total Gyms fold up. A Pilates reformer can range in size from 10.5 to 16.5 square feet and can weigh 58 to 107 pounds. Many reformers also fold up. Both machines provide similar workouts based on body-weight exercises. By doing exercises such as push-ups, crunches and pikes on these machines, the suspension element increases the effectiveness. The Total Gym sells many DVDs outlining equipment-specific exercises you can do on the Total Gym. The Pilates reformer also has many equipment-specific exercises which you can find online or on a variety of DVDs. Depending on where you buy your reformer, it may come with some DVDs. Both machines focus on a full-body workout, including legs, arms and core. 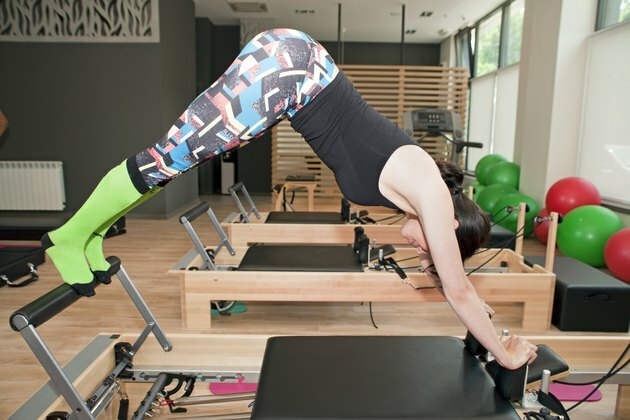 The Pilates reformer, however, focuses on core strength as the primary means to gaining strength in the limbs. Both machines are effective and have similar purposes. The Total Gym works great both as a fitness tool and as a physical therapy tool, as the suspension system provides a safer environment for the muscles to work. It takes some of the strain off of the bones and joints, providing a safer workout. The Pilates reformer operates on the same idea. As many of the exercises as done lying down, it allows you to work your muscles with very little stress to the joints and bones and gives you the ability to work on alignment and flexibility as well as strength. Is the Total Gym Worth the Price?